The size you want isn't listed? Contact us at 419-445-1769 and we'll get you situated. Non-heated, clean, dry, and secure. 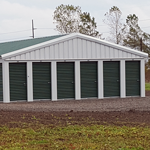 These units are located on the outside of the building and feature a garage style roll up door.